In his article “The little Dictionary had no chance”, which was published in the American Chronicle on April 17, 2011, Risto Stefov says that he is wondering why the Greeks are behaving the way they do and he has obviously found somebody by the name J.S.G. Gandeto who has written a book called “The Theft of a King who Stole Alexander” and he uses that book as his, I may say, Gospel to explain the “Greek behavior” as it is presented or described in that book by a man who I think he may be as qualified to do that about the Greeks as Judas might had been asked to do the same thing about Jesus Christ. I do not know for sure but I would like to think that there are books out there that explain or describe the Greek behavior but J.S.G. Gandeto is writing things about the Greeks and their behavior that Risto Stefov wanted to hear and thus present in his article whatever claptrap he was able to find in J.S.G. Gandeto´s book that was written to allow himself and his fellow South Slavonians Slavs to vent out their passion, hate and malice against the Greeks because they are not willing to give them what they want although nothing ever was theirs or belonged to them at any time in history. Before I go on with the R. Stefov and J.S.G. Gandeto collaborative effort to explain, as they say, the Greek behavior which they seem to be so much concerned with nowadays, I would like to make a reference to the two criminal acts of FRAUD and FORGERY for which the South Slavonian Slavic people as well as the above mentioned two individuals have not so far come forward and express any remorse for the pain, suffering and sorrow that they have caused to the Greek people whose behavior they are trying to explain although they ought to look at their own behavior which can be explained by insanity, paranoia and schizophrenia for not admitting that they have committed fraud and forgery against the Macedonian Greek identity theft and, also, for not being willing to reach a compromise regarding the Macedonian name issue or accept the fact that it needs to be returned to the Macedonian Greek people, who are the rightful owners of it and need it back as soon as possible. So I say to them that If the Greeks like to think that they have a national homogeneity and racial purity, they are not in any way committing any crime against their neighbors. They are not calling their country, their people or their language by using names that they have stolen from their neighbors. 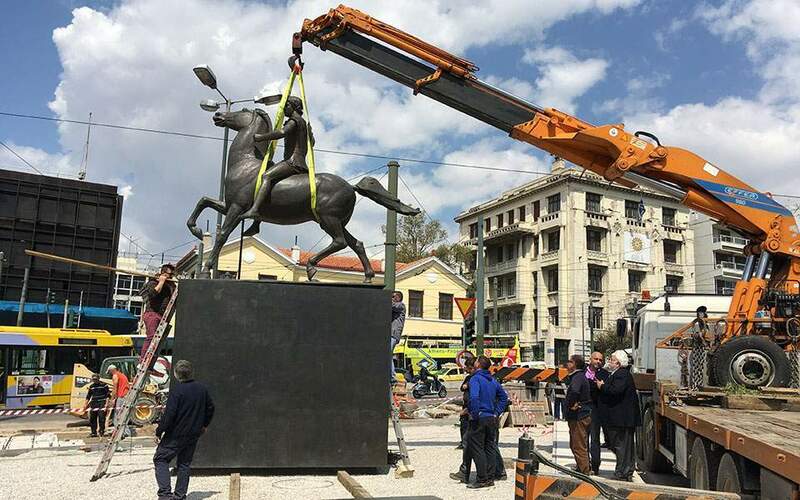 However, the Greeks have every right in the world to protest, contest and defeat any attempt made by the South Slavonian Slavic people who obviously think that they can steal or usurp their precious and glorious Macedonian Greek heritage. 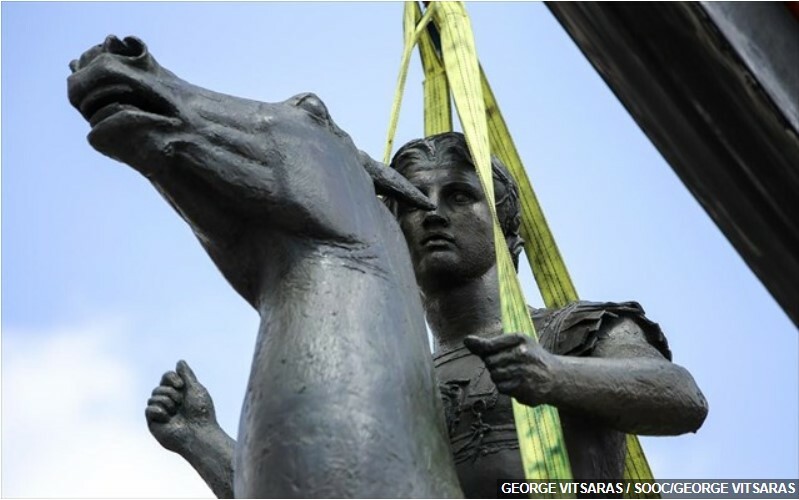 What kind of people would we be if we did not care to protect our country against those who think they can steal our national or Macedonian heritage? We do what any normal people would do to protect and defend what we have inherited from our ancestors and has been ours for more than two or so millennia . Is this bad behavior? Obviously not so for those of us who care about who they and what they are and want to continue to be proud descendants of their great ancestors. Bad or criminal behavior is the one displayed by the South Slavonian Slavs who do not respect the property or ownership rights of their neighbors but they think that what they cannot make or have for themselves, they will take or usurp from their neighbors and, then, claim it as their own by fraud and forgery and they never, ever, have apologized or have expressed any regrets for the fraudulent act of the theft of the Macedonian identity , the fraudulent usurpation of the Macedonian Greek name and the wicked and criminal attempt to assign a Slavic identity to Macedonia by using again the fraudulent name of the name Macedonia for a country that has never been Macedonia at any time in history and it has been inhabited by non-Macedonian South Slavonian Slavic people. So, I ask my readers what kind of behavior is that on the part of the South Slavonian Slavs, if not, the behavior of criminals who specialize in FRAUD and FORGERY with no apology or justification for it and no acknowledgement for any sort of wrong doing or any expression of remorse for the pain and suffering they have created to the Greeks. So, R. Stefov goes on with the help of his equally Greek-hater friend J.S.G. Gandeto to explain the Greek behavior by telling us that , if problems with Greece´s neighbors do not exist, then they must be created whether it may be with Turkey, Bulgaria or with the state that is falsely called “Macedonia”. The truth is that Greece never created any problems with its neighbors but, on the contrary, the problems that Greece is facing with its neighbors are real and they accredited to its hostile neighbors who are constantly are trying to provoke, intimidate and threaten the Greek people in order to undermine the territorial integrity of their country. Bulgaria and Turkey have used force to usurp Greek land but the South Slavonian Slavs of former Yugoslavia are trying to do just that but in a rather subtle and sinister way since they had failed to do it militarily when they were Bulgarians in the years 1912 and 1913 and later on again when they were Yugoslavians in the years 1947-1949. I personally challenge Risto and Gandeto to prove me wrong. Why would the South Slavonian Slavs try so hard to blame the Greeks for creating problems with their neighbors when all the facts point at them because they are the ones who have devised and used the “Macedonization” scam to defraud the Greek people of their Macedonian Greek identity and, therefore, use it in order to create a fraudulent “Macedonian” identity for themselves , their country and their language while at the same time, creating and causing identity confusion, identity crisis and identity deprivation among the Greek people of the Macedonian province of northern Greece. I believe that Risto and his equally Greek-hater friend Gandeto in their effort to explain the Greek behavior did exactly the opposite and, so, unwillingly and unintentionally they have revealed and exposed their own evil minded, hateful, despicable and heinous behavior as well as their personal hostility and animosity towards the Greeks who have never done anything so far to harm or hurt them in any way possible. Unfortunately, as the Greeks try to become more reasonable and rational in their approach towards negotiating a fair and just solution regarding the Macedonian name issue, the South Slavonian Slavs, on the other hand, appear to be more incorrigible and impudent as they constantly attempt to create more and more problems with the people of the Macedonian province of northern Greece by asking them t or trying to impose upon them the approval of the recently published and so-called Greek-“Macedonian” dictionary which is another aspect of the continuation of the crimes of FRAUD and FORGERY against the same poor Greek people who have already suffered so much from the South Slavonian Slavs in the last fifty or so years and did not had enough time yet to recover from that suffering. First of all the Macedonian people of northern Greece have always been Greek and have always spoken the Greek language and, therefore, the so-called Greek-“Macedonian” dictionary was not, obviously, intended for them but obviously for the Slavic speaking people who only speak a somewhat similar language but have nothing else in common with the South Slavonian Slavs who like to refer to them by using the fraudulent “Macedonian” name for the sole and fraudulent purpose to falsely identify these Slavic speaking Greek people with themselves who also falsely and fraudulently call themselves by the same pseudo-“Macedonian” name. I would like to ask my readers how corrupt, dishonest and deceitful can the South Slavonian Slavic people be and what right or authority do they have to publish and, then, try to get the approval of the so-called Greek-“Macedonian” dictionary in the sovereign country of Greece where only the official Government has the right and the authority to negotiate the use of such a dictionary for the Slav speaking people as long it is done legally and is not used by outsiders to impose a false and fraudulent identity upon them and use them to promote the fraud and forgery of the Macedonian Greek identity for pseudo-Macedonian purposes. The main reason that the South Slavonian Slavs wanted to get the approval of that dictionary was obviously to show themselves that the Macedonian name does not represent Greek people but Slavic people and, above all, that the name Macedonia does not represent a Hellenic land but a Slavic one and, therefore, the Macedonian history and heritage do not belong to the Greeks but to the South Slavonian Slavs just because they like to call themselves by that same name as we do. Furthermore, the South Slavonian Slavs were trying so hard to have that dictionary approved because they wanted to mislead, confuse and deceive the people of the world that the Slavic idiom spoken by the Slav speaking people of Hellenic Macedonia is not a Bulgarian peasant dialect but a so-called “Macedonian” language when even Risto Stefov in one of his articles was stating that the Macedonian people of antiquity were speaking the Greek koine which he was referring to as the Alexander´s koine language. Another piece of evidence for the Greeks to prove to the world that the South Slavonian Slavs would do whatever is possible to assign a Slavic identity on anything and everything of Macedonian ancestry whether it is history, heritage, language, people or land so that the crimes of Fraud and Forgery are totally and entirely completed as planned without any judicial, legal or political consequences for the South Slavonian criminals of the “Macedonization” crime scam against the Greek people who did not get much cooperation and support from either the European Union or the United States who were perfectly aware of the crime, the motive and the perpetrators. I think that I have presented enough information for my readers to realize that it is not the Greek people who create and cause problems for their neighbors but it is Greece´s neighbors and mainly the South Slavonian Slavs of former Yugoslavia as well as the Albanians and the Turks but I like to deal with one of them at a time. The crimes of fraud and forgery do not stop here and I would deal with more of the same or worse as I go on. I know that the disapproval of the so-called Greek-“Macedonian” dictionary was a great defeat or disappointment for R. Stefov and J.S.G. Gandeto who were very bitter, hateful and hostile because they did not accomplish whatever evil and wicked intentions they had in their convoluted minds. 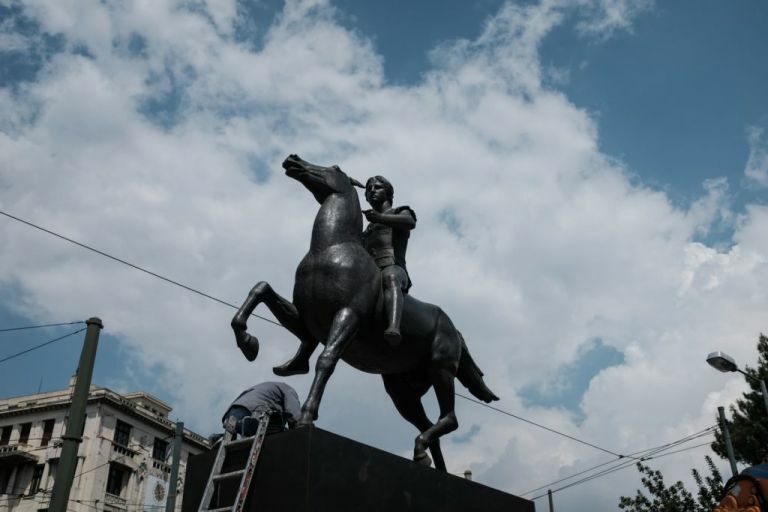 So, they found another excuse to attack the Greek people and accuse them of attempting to culturally assimilate and ethnically erase the Slav speaking population by denying them the right to identify themselves as ethnic “Macedonians “when most of those Slav speaking people are ethnically or nationally Greek while some of them who many years ago may have been Bulgarian- minded because they may have been of Bulgarian descent since not all of the Bulgarian speaking people went back to Bulgaria after the exchange of population. So, then there are no such thing as ethnically “Macedonian” people in Greece as there is no “Macedonian” ethnicity or even nationality among the South Slavonian Slavs because even the fraudulent “Macedonian” name they use for themselves is not and cannot be an ethnic name because it is stated in their constitution that it is a “constitutional” name and no constitutional name designates ethnicity. Moreover, the Macedonian name that they usurped from us was never used in antiquity to designate ethnicity or nationality and the ethnicity or nationality of the Macedonian people was Hellenic. The South Slavonian Slavs as soon as the “Macedonized” themselves and tried to “Macedonize” other Slav speaking people, they went ahead and fraudulently ethnisized or nationalized their “Macedonization” so that they can use it as a fraudulent “Macedonian” national identity in order, as I said earlier, to assign a Slavic identity to Hellenic Macedonia and, therefore, incriminate the Hellenic identity of Macedonia and, if possible, undermine the sovereignty of Hellenic Macedonia. Mr. Gandeto does not hesitate to tell us in his book that the Greeks have confiscated land that belongs to the Slav speaking people and, obviously, the Greeks have confiscated lands that belong to the South Slavonian Slavs because, since, we are Macedonian Greek people and they call themselves, but fraudulently, “Macedonians”, then the pseudo-Macedonians become the owners of lands they never owned before in history or ever belonged to them. In other words, the criminal South Slavonian Slavs think or believe that the usurpation of the Macedonian Greek identity from the Macedonian Greeks and the fraudulent use of it for themselves would enable them, but fraudulently, of course to the ownership of our Hellenic Macedonian land. In other words, they did not just steal and use for themselves our Macedonian Greek identity, our history and heritage but they dare lay claim on our Macedonian Hellenic land. I really believe that these people must be insane, paranoid and schizophrenic to make such accusations about a fantasized confiscation of lands by the Greeks when they know or ought to know that the Macedonian lands we are talking about, except for the Pellagonian territory never got to be inhabited by the South Slavonian Slavs whose country consists mainly of ancient Paeonia and Dardania and even those were Serbian territories that were handed over to them about twenty years ago with the help of the United States. I , also, would like to say that the Macedonian land that is under Greek control was not confiscated or stolen from the South Slavonian Slavs as it was always ours and Hellenic but it was liberated from the Ottoman Turks during the first Balkan war in the year 1912. However, in the year 1913, while the Greeks were busy fighting the Bulgarians to prevent them from taking over Macedonian land, the Serbians came down to Pellagonia and made it a Serbian territory by the use of military force. Let it be known that the Greeks were defending their Macedonian land against two Slavic nations and they could only deal with one of them at a time. So, then in an uneven war they had no other choice but lose Pellagonia to the Serbians in order to save the rest of the Macedonian territory from the Bulgarians. Once again I would like to inform my readers that the fraud and the forgery never comes to an end and the criminals, never stop accusing the victims of a crime when the evidence is overwhelmingly against them. It sounds like the criminal is shouting about theft in order to chase the owner out of his house. I, also, like to respond to another accusation made by Mr. Gandeto against the Greeks in which he says that they are guilty of imposing their Greek culture and language on other people while as I mentioned earlier it was the South Slavonian Slavs who have tried, although unsuccessfully, to impose the so-called Greek-“Macedonian” dictionary to the Slav speaking Greek people for the purpose of promoting their South Slavonian Slav culture, identity and language which they call fraudulently “Macedonian” while they and all of us know that their language is a Serbo-Bulgarian language and their identity has nothing to do with that of the Macedonians who were always Greeks and spoke their own Greek dialect. 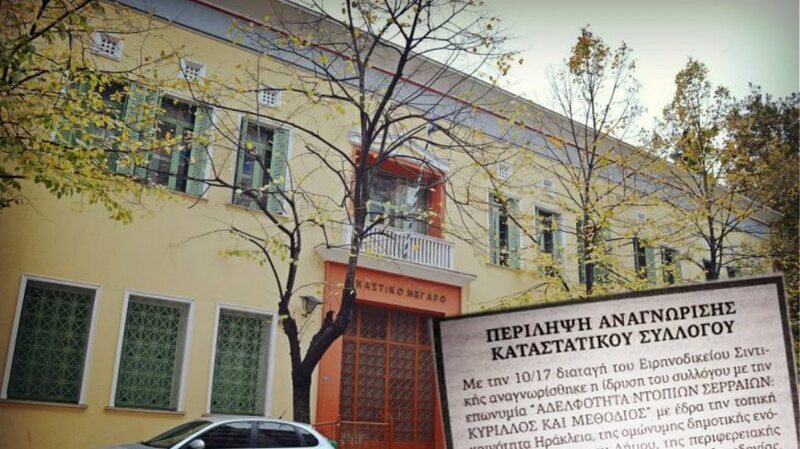 There is, at least, one more accusation against the Greeks that I do not want to let it go unanswered because it presents the Greeks as the most proficient thieves and fabricators of history in the Balkans. Mr. Gandeto does not take the time to get specific about it and tell us which nation´s history in the Balkans have the Greeks so proficiently stolen or fabricated and, above all, which nation in the Balkans has that much history or it is famous for its great history and the Greeks have tried to steal from it or have tried to fabricate history for any reason unknown to me. I would like to make a wild guess and dare say that he is referring to his country which is the only one the Balkans without an identity and history and has every reason in the world to try to steal history from the Greeks and fabricate a pseudo-Macedonian identity for their country, themselves and their language. It is obviously another case where a criminal accuses the victim for a crime that is being committed by his own criminal people. Well, it is also possible that Mr. Gandeto is trying to tell us that the Greeks may have stolen the ancient Macedonian history and heritage and, therefore, they have fabricated the Macedonian Greek identity, something that all the other South Slavonian comrades seem to be so much willing to accept and believe because it incriminates the Greeks but it justifies the South Slavonian fraud and forgery. The Greeks do not steal anybody´s history, but they just make history and they do it by working together with Greek people from different parts of the Hellenic world. The Greeks fought often against each other for dominance, control or territorial expansion but they also fought together and won against the Persians who threatened to destroy their country. The ancient Macedonians and the other Greeks fought against each other for control or dominance of the Greek land but the Macedonian Greeks prevailed and established the Macedonian hegemony which brought about a force-imposed Greek unity that helped again to unite the Macedonians and the other Greeks for a campaign against the Persians. What I am trying to show to my readers is that the Greeks did not steal the ancient Macedonian history but, on the contrary, the Macedonians and the other Greeks made their history together and for the good of the whole country and not for either one of them in particular. Therefore, the Macedonian history was made by Greeks and for the Greeks and no one else has any right whatsoever to lay hands on it. The Macedonian history has always been Greek and it will remain Greek because the ancient Macedonians were also Hellenic people and not Hellenized as some people think of them but they never, ever, try to tell us or explain to us how, when , why and by whom were they Hellenized if they were not originally Hellenic people. Why would the ancient Macedonians have chosen to become, say, Hellenized and accept a Hellenic identity, culture and language from, say again, the Greeks when at that time they were the masters of most of the Hellenic world and much of the Balkans? If there are any people who for some reason propose such a theory, I would like for them to come forward and explain to me and all the others how, when, why and by which particular Greek group did the so-called Hellenization of the ancient Macedonians take place and, therefore how was it possible for the Macedonians to learn, for example, a “foreign” Greek language and , then, use it throughout their campaigns and make it become the equivalent of the English language of today. In conclusion, the Greeks did not in any way try to steal, as Mr. Gandeto claims the Macedonian history, nor did they fabricate the Macedonian Greek identity. 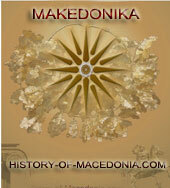 On the contrary, the Macedonian history is an integral part of the Hellenic history while the Macedonian identity was always Hellenic because the ancient Macedonians were people of Hellenic stock and, therefore, the Greeks never, ever had to use FRAUD and FORGERY to justify the Greekness of the Macedonian history, identity or language. 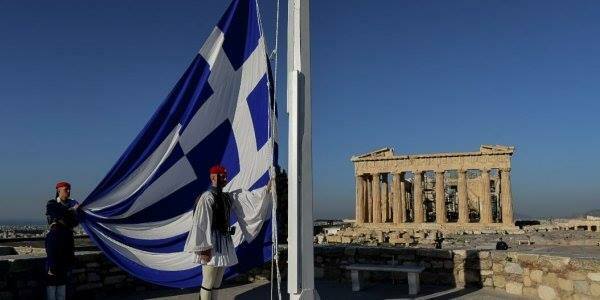 I ask again who are the thieves, the fraudsters and the forgers of the Macedonian Greek identity, history and heritage? The answer is who else but the infamous South Slavonian Slavs of former Yugoslavia. Finally, I would like to comment on Mr. Gandeto´s reference to Eugene Borza and Ernest Badian whom he describes as being attacked by the Greeks for writing books and articles against them. I personally think that both of these Professors know the truth about Macedonia and the Macedonian people but they must have their reasons to lie about them. I do not believe that every Professor has the required intellectual honesty and integrity of character. Historians know the truth but they must stay away from politics and other means of corruption. I have known that both Borza and Badian have cast doubt about the Hellenism of Macedonia or the Macedonians, but I would like to believe they did not do it for historical reasons. However, although these Professors deny in some way the Hellenism of Hellenic Macedonia, they really fail to provide any documentary evidence or proof to justify their claims as they just present simple and convenient speculation while they overlook or disregard many important historical facts. Again why do they refer only to those two Professors while there are so many others who may be telling the truth but the South Slavonian Slavs do not want to hear about them. Not everybody has a reason to lie and not tell the truth and I know that there over two hundred of them or more who have signed a letter written to President Obama and they all want the President to discredit the fraud and the forgery. In conclusion, I say to my readers that the crime has been exposed, the motive for the crime was explained and the criminals were identified as well as the victim. I hope we all work together and do something soon to put the perpetrators away, where they belong. Justice must and will prevail and the crime should be punished in order for us, Greek Macedonian people to be vindicated. J. S. Gandeto is actually Joseph Grezlovski, born in Lyuboino village, which is near FYRO Macedonia -- Greece border, just next to Prespa Lake. He was born in Jugoslavia so his words cannot be counted as reliable. Of course, on the other hand the stupid lies that Nick Michael Hodges writes are also interesting. He writes: I , also, would like to say that the Macedonian land that is under Greek control was not confiscated or stolen from the South Slavonian Slavs as it was always ours and Hellenic but it was liberated from the Ottoman Turks during the first Balkan war in the year 1912. However, in the year 1913, while the Greeks were busy fighting the Bulgarians to prevent them from taking over Macedonian land, the Serbians came down to Pellagonia and made it a Serbian territory by the use of military force. Let it be known that the Greeks were defending their Macedonian land against two Slavic nations and they could only deal with one of them at a time. This is absolute lie, because in may 1913 Greece and Serbia signed a secret treaty in which they both agreed the present border without giving Bulgaria any of those territories. Even before the end of First Balkan war, when bulgarian soldiers who libereted Kukush (Kilkis) Gumendzhe (Gumenissa), Drama, Kavala, Syar (Serres) and other regions were sent to fight the turks in Thrace. While that the greeks and serbs occupied even more teritories pushing with fire the few bulgarian soldiers in this region. It is interesting that some bulgarian komitadjis, who helped the greek army in Southern Macedonia were kept in prison in 1912 and before the Second Balkan war sterted they killed them in jails. Such are the stories of Dimitar Robkov from Kriva (today Griva, Peonia) and many others. SO in conclusion Greece and Serbia both agreed to make this border against macedono-bulgarians. So you have no right to search for greeks in modern Bitola (monastir), Gevgeli or else..